Feel good in East Friesland! Enjoy the peace in an old Gulf farm! 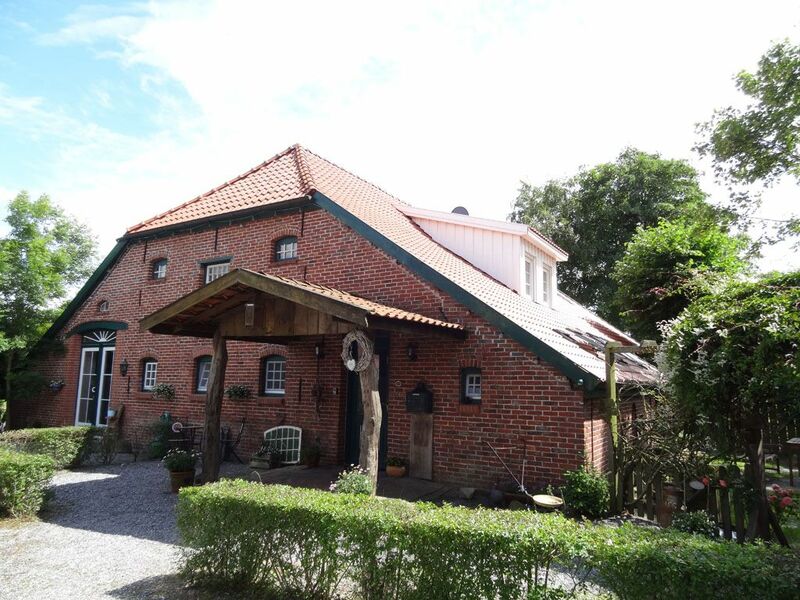 Our four-star Bremerers Deele apartment is located in the southern part of East Frisia, in the municipality of Rhauderfehn. Our guests will find peace and relaxation in the comfortably furnished apartment in the quiet village of Rhaude in Overledingerland. Up to two people enjoy high-quality accommodation in the newly furnished property and interesting opportunities to explore the region at first hand. In the bedroom you will find a large double bed with a fixed and a medium-sized mattress. In addition to a generous cut of around 70 square meters, the holiday residence offers recreation-seeking holidaymakers on a terrace fully equipped with barbecue and seating furniture. With its authentic style, the light-filled apartment is one of the romantic havens that combine the flair of the past with modern equipment standards. The living room becomes a popular meeting place with comfortable seating furniture and a dining area. A fully equipped kitchen simplifies the self-service and a bedroom with comfortable beds and a modern bathroom complete the tasteful and functional decor. The former village café of Rhaude is also an ideal starting point to explore the nearby German Fehnroute with the free rented bicycles. From the well-kept property, East Frisian holidaymakers reach the Lower Saxony Mühlenstraße after only a few minutes, which leads along magnificent windmills, historic brick-built churches and picturesque watercourses. Hiking enthusiasts can also easily reach the Ostfriesland hiking trail within a short time. Guests of Brauers Deele spend undisturbed days in a lovingly restored mansion with loving amenities. Are you 6 persons? Even then, brewer Deele is something for you. Together with our apartment Hahnbalk (in the same house) you can accommodate up to 6 people. In the new bathroom there is a flat shower tray for easy and safe entry. In addition to a towel heater you will also find a hair dryer in the bathroom. Upon request, a bread delivery service is possible! Sehr schöne geräumige Wohnung in sehr ruhiger Lage. Wohnung ist genau wie beschrieben. An- und Abreise unkompliziert. Wohlfühlwohnung. Sehr schöne und liebevoll eingerichtete Ferienwohnung in wunderschöner Landschaft. Es fehlt an nichts und läd auf jeden Fall zum Wiederkommen ein. Als wir die Tür aufgeschlossen hatten schauten wir uns um und sagten schick, gemütlich! Heimelig im Landhaus Stil! Alles war sauber und ordentlich! Die Wohnung ist umfassend ausgestattet. Spülmaschine, Waschmaschine sind auch vorhanden! Selbst an Kaffee, WC Papier und Küchentücher mangelt es nicht! Das Bad Top Modern! Die Wohnung selber ist absolut ruhig gelegen! Früh am Morgen kräht irgendwo ein Hahn, ein Geräusch welches wir schon lange nicht mehr gehört haben! Aber das stört absolut nicht! Unsere Räder konnten wir im Schuppen unterstellen, so standen diese nicht ungeschützt irgendwo herum! Unsere netten Gastgeber haben wir kurz kennen gelernt! Insgesamt haben wir uns sehr wohl gefühlt und können die Wohnung gerne weiter empfehlen! eine sehr schöne liebevoll eingerichtete Ferienwohnung! Das Einzige, was man noch verbessern könnte wäre die Terrasse etwas mehr zu befestigen - und es war etwas hellhörig von der oberen Ferienwohnung. Aber für andere Gäste, die sich nicht benehmen können, können die sehr freundlichen und hilfsbereiten Vermieter nichts!!! Wunderschöne Ferienwohnung !!!! Sehr sauber & sehr gepflegt !! Die Vermieter sind super nett und man merkt das alles mit viel Liebe zum Detail eingerichtet wurde !!! Es hat uns und unserem Hund dort so gut gefallen , leider war der Ur!auf zu schnell vorbei ! Die Ferienwohnung ist eine idealer Ausgangspunkt für viele Ausflüge ( Leer , Papenburg oder Langeoog usw.) !! By 2010, there was still the village café of Rhaude in our house. Much has happened since. There has been much restored and modified. Importantly, however, we had to preserve the charm of the old Gulfhofes. The village is part of the East Frisian Rhaude community Rhauderfehn and one of the oldest settlements in Overledingerland. In the first written references (1438 and 1439) the place is called Rawede or Rawide.